I came from only a mile from here. I’ve lived no more than a mile from where I was born. I was born in… down just south of the park where my father was a doctor and he had his residence there in Park Crescent. I was born there in 1934. My father was an English doctor, he was a psychiatrist by that time. My mother was a writer and a novelist, there’s a picture… there’s a sculpture of her by my father, there. Both of them were the children of Lithuanian Jewish immigrants. My grandfather - my father's father - came in about 1868… 1870, to the East End of London where he established himself near Brick Lane as an importer of fur, and he was, as so many Jews were, he was a fur merchant. And my mother's father was also born in Lithuania and he took a ship bound, I suspect, as so many of these ships were, for New York, and was offloaded in Cork, so he must’ve misheard when they landed, Cork, oh, New York, this is where I get off, and he did indeed get off in Cork, and I think he probably sold stuff in the street as a 12 year old boy, and then he gradually became a businessman and became fairly prosperous, and my mother was born in Cork in about 1910, with two brothers and a sister. Her mother was a Swedish Jew born in Karlstad, related to the French philosopher Bergson. She was a Bergson, a Jewish family that I suspect had arrived in Sweden from Poland in the 1840s, and they had a large, and once again, a prosperous clothing business in Karlstad. And then she married my maternal grandfather and moved to Cork where my mother was born in 1910. 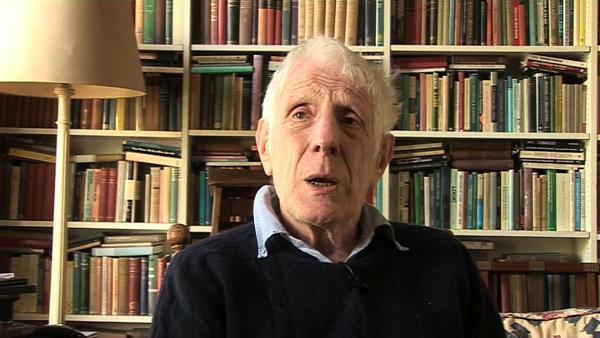 Initially studying medicine at Cambridge, Sir Jonathan Miller came to prominence with the production of the British comedy revue, Beyond the Fringe. Following on from this success he embarked on a career in the theatre, directing a 1970 West End production of “The Merchant of Venice” starring Laurence Olivier. He also started directing opera, famously producing a modern, Mafia-themed version of “Rigoletto”.